I found this lovely mod yellow planter at a yard sale a couple of weeks ago. The shallow shape and scalloped detail were so appealing, I knew I had to do the planter justice and create a beautiful scene for it. I hunted for the perfect plant and props, experimenting with the best arrangement. I went with my favorite prop, skittles colored dinosaurs! They roam the miniature landscape, unaware of their magnificent beauty. 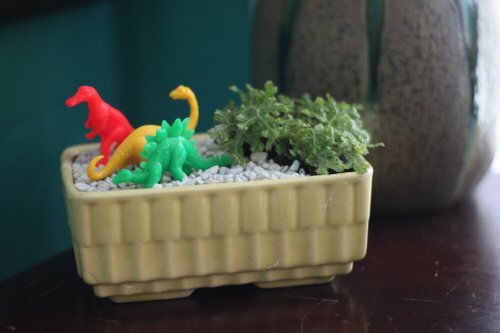 The tiny moss plant was $2.99, the little dinosaurs came from the ubiquitous thrift store dollar bag of toys, and this little pot only required a cup or two of dirt and a handful of white aquarium gravel for mulch and drainage. It was a thrifty fix. If your planter lacks drainage holes, fill the base with a couple inches of aquarium gravel for drainage before adding the dirt. 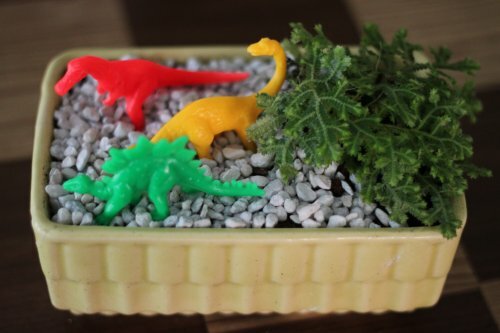 (Check out how to use your vintage planters for more tips.) 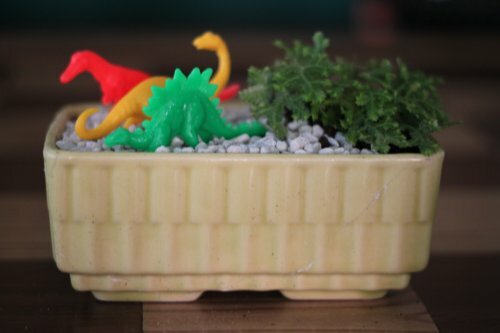 A detailed post on potting vintage planters is coming up next month. I'm going to focus on Spring related topics all April! It will be sad to see this beauty go, but my filled vintage planters sell well for me at the antique store. 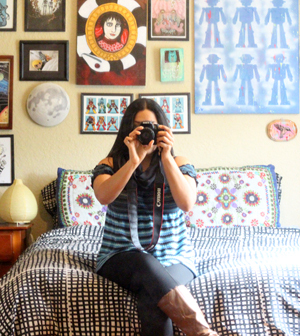 I know this arrangement will bring whimsy into someone's home. 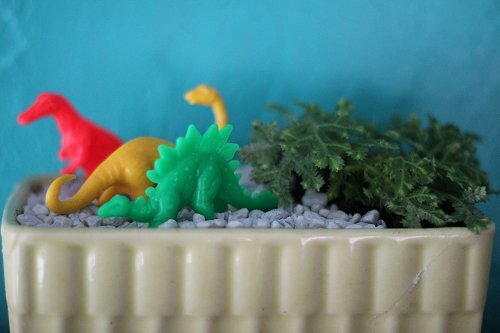 My favorite potted scenes tell a playful story. How do you like to pot your plants? Let me know if you have any questions in particular, Kylie. I love potting things. I would like to purchase that from you. Simone: 3 digit number for the Anthro piece! I definitely like your price better, and thank you for the kind words. ah! got my answer :) i wasn't sure if you were making these to sell or for decorating your booth (i know you'd written about that before).